¡su pasión perfora me corazón! This tapestry was woven for Lotería! de Tucson, an art exhibit based on the Mexican game of chance (similar to Bingo). Originally brought to Mexico from Imperial Spain in 1769, the lotería game was adopted first by the elite class and eventually spread throughout Mexican society. Early in the history of the game, cards and boards (tablas) were hand painted by artists. The introduction of the printing press led to mass printed cards and tablas. The modern (Don Clemente) lotería deck is made up of 54 cards featuring images that have become as iconic and associated with Mexican pop culture as the sugar skull of Día de los Muertos, the Virgin of Guadalupe, and the works of Mexican artist Frida Kahlo. ​Lotería is the Spanish word for lottery. To start the game, the caller (cantor, or singer) randomly selects a card from the deck and announces it to the players by its name, sometimes using a riddle or humorous patter instead of reading the card name. The players with a matching image on their board mark it off with a chip or other kind of marker (many Mexican people traditionally use small rocks, crown corks or dried pinto beans as markers). The first player with four chips in a horizontal, vertical or diagonal row, squared pattern,any other previously specified pattern, or fills the tabla first shouts "¡Lotería!" (Lottery!) or "¡Buenas!" (Good!) and is the winner. Represented in the invitational exhibit were 54 artists from Tucson, Phoenix, Los Angeles, Houston, New York, Canada, Chile and Spain. Prior to the exhibit, artists gathered at the gallery and drew cards lottery style from a Mexican pot. We were not allowed to ask for a specific card, but we could trade cards with other artists. 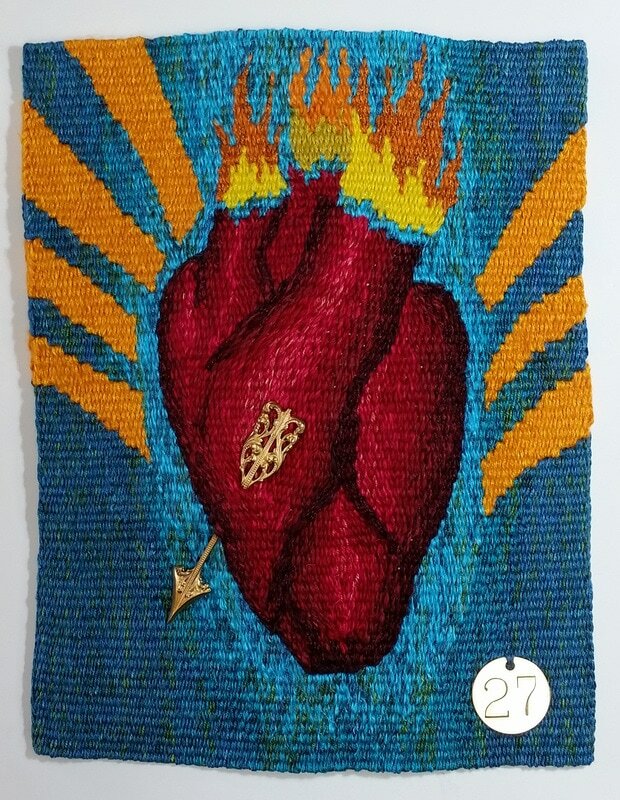 I ended up with card #27 el corazón. Artists were allowed to interpret their individual cards however they chose in any medium; the only set requirements were for size (all were 14" x 11") and the work had to include the card number.